A warm welcome greets you every time you step out of the shower or bath, thanks to the Ancona Comfort 7 Wall Hardwire towel warmer. Its brushed elegant timeless design and convenient size, allows an easy installation in any room needed, blending perfectly into the space available. As the name implies, this item features 7 racks for accommodation, reaching ideal thermal warmth and coziness in only minutes. The Comfort 7 Hard Wire includes the additional feature of a 24 hour 7-day digital timer which is great for energy savings and security. The hard wired plate discreetly conceals the wire, creating a flawless fit into your wall. Gorgeous in bathrooms and full of possibilities in the laundry room, exercise room, mudroom or bedroom - it's the indispensable item for your home. Enjoy the luxury of a warm towel everyday with this attention grabbing, double loop towel warmer design. In high style, the 4-bar wall mount unit pivots for up to 180 degrees of movement, making it effortless to hang and remove towels. With a beautifully polished chrome finish, this bathroom accessory will keep your towels warm and dry. Perfect for compact spaces. Weighs just 7 lbs. and plugs into standard 120V outlet. Comes with brackets and hardware for easy installation. Built-in on/off switch located at the base of the unit for easy operation. A warm, dry towel doesn't have to be a luxury anymore. You can enjoy this creature comfort every day. Featuring 10 sleek bars that provide ample space for hanging towels or a bathrobe, it has a graceful profile with a beautiful brushed stainless steel finish. This plug-in model includes installation hardware and houses a hidden on/off switch at the base. The Maui towel warmer from WarmlyYours features an innovative design with an integrated, non-heating storage shelf for extra towels. With its compact design, this model delivers all of the functionality of larger units without taking up unnecessary wall-space. The hardwired electrical connection for the wall-mounted Maui will provide a streamlined look without visible wires. The 7 heated bars will deliver a heat output of 222 BTUs per hour which will not only warm your towels and bathrobes but also dry them between uses. The highly polished finish, 304-stainless steel construction, and curved design of the Maui means this towel warmer will instantly fit into any contemporary design motif. This model comes with built-in TempSmart overheat protection to prevent the unit's surface temperature from exceeding 149°F (65°C). 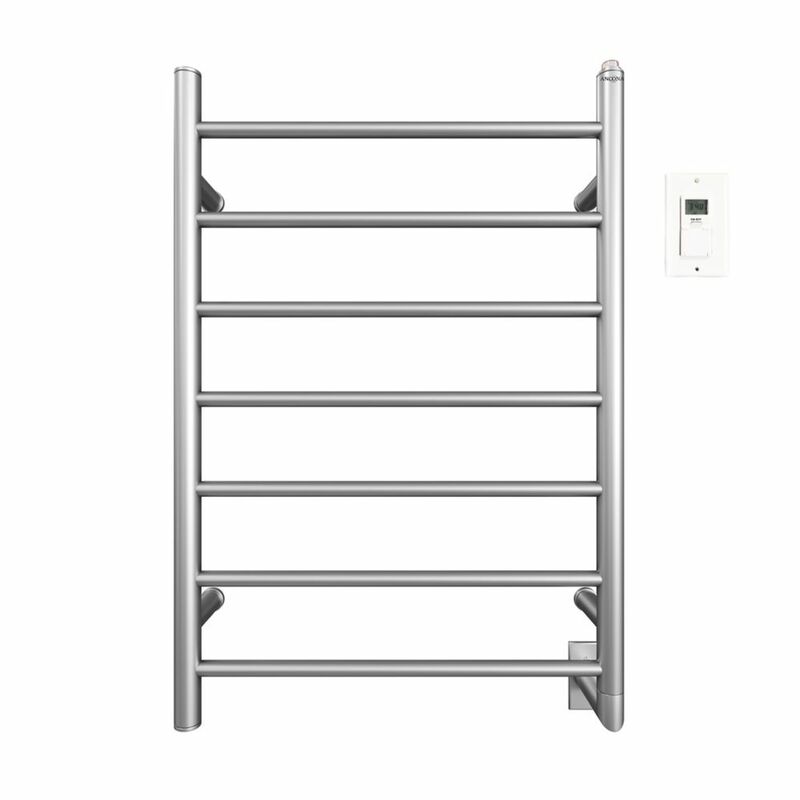 Comfort 7-31 inch Hardwired Electric Towel Warmer in Brushed Stainless Steel with Timer A warm welcome greets you every time you step out of the shower or bath, thanks to the Ancona Comfort 7 Wall Hardwire towel warmer. Its brushed elegant timeless design and convenient size, allows an easy installation in any room needed, blending perfectly into the space available. As the name implies, this item features 7 racks for accommodation, reaching ideal thermal warmth and coziness in only minutes. The Comfort 7 Hard Wire includes the additional feature of a 24 hour 7-day digital timer which is great for energy savings and security. The hard wired plate discreetly conceals the wire, creating a flawless fit into your wall. Gorgeous in bathrooms and full of possibilities in the laundry room, exercise room, mudroom or bedroom - it's the indispensable item for your home. Comfort 7-31 inch Hardwired Electric Towel Warmer in Brushed Stainless Steel with Timer is rated 4.5 out of 5 by 2.